Editor's Note: This is a guest post from Jonathan Cipriano, creative developer based in San Francisco currently working as a Creative Research & Development Manager at AKQA. A few weeks back, the Make-a-Wish Foundation made a 5-year old cancer survivor named Miles dream come true by helping him play out a Batman-style adventure in San Francisco. The city was morphed into Gotham for a day with the help of 12,000 volunteers. A rescue mission turned the pint-sized crusader into a social media sensation. Miles became Batkid for a day. Inspired by his story, some creative devs at AKQA thought it would be fitting to memorialize the heroic event with an interactive comic book, thebatkid.com and created it on Heroku. 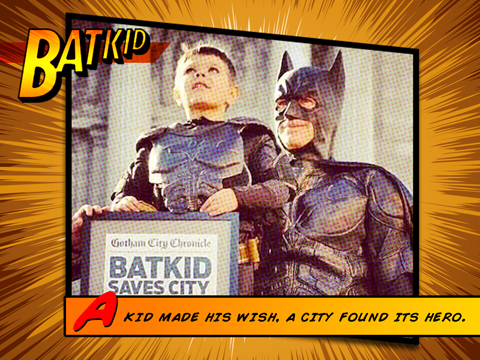 By using images of the #SFBatkid shared through Instagram, Twitter, Facebook and Flickr, our creative team chronicled Miles' adventure as he raced from rescue to rescue, saving the city from crime and earning himself a key to the city from Mayor Ed Lee himself. To best tell Miles’ digital story in a timely and seamless way, thebatkid.com needed to be designed and developed within a few days using a platform that could be easily managed without significant knowledge of server setup and configuration. Naturally, Heroku was an automatic choice. We have all of our source code on GitHub and we were able to deploy the site with custom DNS in literally minutes. With the Heroku CLI, deploying an application only takes 2-3 commands in the terminal. What we ended up creating is something that is actually very simple technically speaking. However, from our experience, even simple projects can suffer if you can't get them live when you need it to. Heroku allowed us to get up and running quickly without the dev-ops overhead, so we could just concentrate on creating a cool comic book for Miles Scott (aka The Batkid).